Water. It’s something our bodies need to function, but it can be difficult to stay hydrated throughout the day -- especially when we’re busy. To make it even harder, there are many popular theories surrounding hydration that can easily confuse us. How much water is enough and how do we know when we are dehydrated? 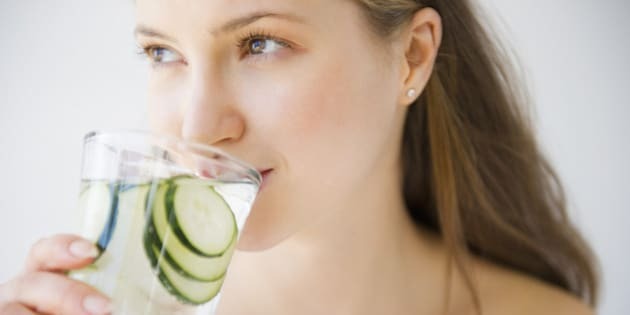 “Being hydrated means having adequate water in your body so that all of your systems are able to function correctly," accredited practising dietician Chloe McLeod told The Huffington Post Australia. Dehydration has also been shown to increase the possibility of driving errors and can have the same effect as drink driving. “Depending on how dehydrated you are, your ability to concentrate can be impaired as much as if you are really tired or if you’ve had a couple glasses of wine. So it can significantly affect your ability to complete day-to-day tasks," McLeod said. So what about the hydration theories we often hear? “That is actually true,” McLeod said. “I always like to recommend keeping a bottle or glass of water on your desk, or keeping your water with you during the day, so that you can sip on it regularly -- just to help you avoid getting to that point of feeling too thirsty,” McLeod said. “It definitely depends -- I like to think this is approximately true,” McLeod said. Being in air conditioning all day can also increase the amount of water you need as it can be drying, according to McLeod. “The best guide to go by is the colour of your urine,” McLeod said. “It does depend on the shade -- if it’s a very pale yellow then it’s not really a problem, But if it’s much darker then yes -- the darker it is, the less hydrated you are, essentially," McLeod said. While both coffee and tea are diuretics -- meaning you are more likely to pass extra fluids -- it’s a common misconception that they are dehydrating. “Recent studies are actually showing that they don’t dehydrate you as much as previously thought,” McLeod said. “So coffee and tea also count in your tally." “I wouldn’t say drink coffee and tea instead of water (particularly the coffee), but if the majority that you drink is water -- and then a cup of coffee or a few cups of tea -- it’s not going to be as big of a deal." “There’s definitely a limit,” McLeod told HuffPost Australia. “If you drink too much it can result in a condition called hyponatremia, which is when the sodium levels in the blood drops to a really low level,” McLeod said. “But if it’s someone who, for example, is doing a marathon, they can be really useful for rehydration because of the electrolytes and carbohydrates that are in there,” McLeod said. Sports drinks may also benefit someone who is working outside and lifting heavy things all day in summer, according to McLeod. “But otherwise, water is always best,” McLeod said. “It’s probably been hyped up a little bit, but that is part of the function of it,” McLeod said. “So yes, it does do that, but it's not as though you can drink as much as you can to flush everything through -- drink as much as your body is needing,” McLeod told HuffPost Australia. Have difficulty drinking enough water throughout the day? You’re not alone. Here are some tips for staying hydrated. “I always like to recommend keeping your water -- whether it’s in a bottle or a glass -- in eyesight, so that you do have that visual reminder of ‘I better have a drink,’” McLeod said. “Set up a reminder in your email or on your phone, so that you have that external reminder to say ‘have a glass of water’ or ‘have a sip of water,’” McLeod said. “Say you’ve got a 750ml bottle of water -- you can aim to have that drunk say by mid-morning, then aim to have another one drunk by just after lunch, and another one drunk by the time you get home,” McLeod said. Let’s face it -- water can also be boring, but there are two great ways around this. “I usually recommend putting in things that you like the taste of, or use a combination of different things to give the flavours that you enjoy,” McLeod said.